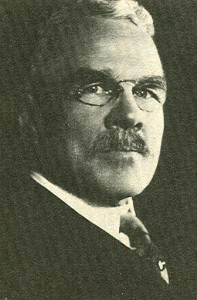 Charles Gordon Curtis (1860-1953) was born April 20, 1860 in Boston, Massachusetts. He graduated from Columbia University with a civil engineering degree in 1881. He also studied law at the New York Law School and graduated in 1883. For several years, Curtis was a patent lawyer, but decided to give up his practice in 1891 to organize the C & C Electrical Motor Company to manufacture electric motors and fans. Curtis patented the first U.S. gas turbine in 1899. Among his other achievements, the Curtis steam turbine of 1896 required one tenth the space and weighed one eighth as much as machines it replaced. He sold the rights to the turbine to GE in 1901. In 1910 he was awarded the Rumford Premium by the American Academy for Arts & Sciences for his improvement of the steam turbine. Above: a GE gas turbine. Over 100 years after Curtis's work on gas turbines GE is still a dominent player in the gas turbine market. Right: one of Curtis's great innovations, the vertical steam turbine. Many other help develop this as seen in the photo but it was Curtis and William Emmet who were the masterminds. He then studied the “scavenging” (removal of burned gases from cylinders) of two-stroke diesel engines and patented the Curtis system of scavenging in 1930. Historians also credit Curtis with inventing the propulsion mechanism used in certain naval torpedoes. 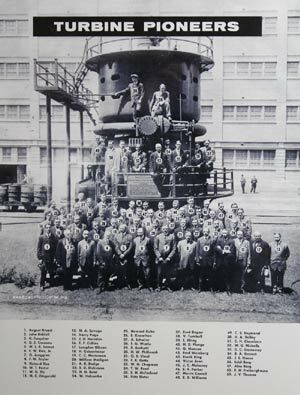 He received the first annual award from the Gas Turbine Power Division of the American Society of Mechanical Engineers (ASME) in 1948. In 1950 he received the Holley Medal from ASME, also for his gas turbine work. Charles Curtis died in Central Islip, New York, on March 10, 1953. Watch our video on the history of Steam Turbines where Historian George Wise talks about the early days of steam turbines, Parsons, Curtis, Emmet and more.